* CompTIA may incorporate newer testing technologies or content into a given exam at any time. It may change the characteristics of its exams without prior notice. The operating system known as Linux is an open source operating system. It is worked on by literally thousands of programmers on a regular basis. Their mission is to enhance that operating system and have their changes incorporated into its latest versions. Small wonder that CompTIA, one of the organizations that tests network admins and aspiring network admins on how much they know about Linux, has made some changes to its original Linux+ exam from 2002. If you are reading this you may be wondering if you can keep up with those changes, even though you may be relatively new to Linux and Linux+. The answer is yes, with our help. We are CBT Vision Inc. and we've been helping people pass the Linux+ exam before they made the changes and we don't intend to stop now. Our help comes in the form of Examiner™. 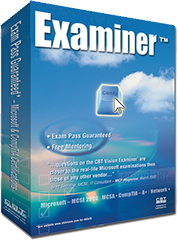 Examiner™ for Linux+ is test preparation software that has everything you need to pass Linux+. Many people are first exposed to Linux when they attempt to install it on an experimental basis. You should have performed enough of these experiments to be able to know how to go about installing Linux based on environment (e.g., boot disk, CD-ROM, network (HTTP, FTP, NFS, SMB)). Be prepared to identify all the hardware involved and to install multimedia options related to video and audio. Filesystems, software and boot loader topics all need to be mastered here. Linux has its own compression and installation packaging utilities. Know how to run them like you own them. Don't forget about pre-installation planning or disk partitioning. A big, broad domain that covers a wide spectrum of knowledge. A lot of that knowledge is wrapped up in knowing how to use the CLI (command line interface). If you can sit down at the shell and use the CLI to manage local storage devices and file systems, to mount and unmount filesystems, to create linked files, to perform various backup operations, to access and write data to recordable media, and to manage runlevels and user permissions you are on your way. Get the picture? There is no picture this is the CLI. Shell scripts, piping and mail queues round out this domain. Three types of configuration tasks are covered in this domain: system settings, network services and access rights. System settings include: mounted drives, partitioning, and X-Windows settings. Network settings include network services such as DHCP, DNS and Apache. Access rights include client network services and settings as well as server settings. It isn't spelled out exactly where print services figure in but LPD, CUPS, BSD and SAMBA related printing question area real possibility here. Security concerns get a domain of their own for the new version of this exam. There is much to do and many tools available for securing a Linux computer. Configuration files with which to be familiar include: hosts.allow, sudoers, ftpusers, and sshd_config. Configuring encryption may involve any of the following: blowfish 3DES, or MD5. Know what to look for in log files and configuring intrusion detection also figure prominently. Implementing basic IP tables/ipchains protection requires knowledge of common ports. Password complexity and user level security issues will need to be addressed. Intrusion detection and system hardening are not to be ignored. Documenting the Linux system involves baselining performance, documenting procedures, documenting configuration, using system logs, using application logs and knowing how to use the help and documentation facilities included with your Linux distro. These facilities include the man pages, info, readmes, and the Web itself. There are still hardware questions on the new exam. They focus on the following acronyms DMA, IRQ, SCSI, PCMCIA, USB, IEEE1394, RAID, and ACPI. Of course, you need to possess hardware know-how far greater than being able to spell these acronyms out. Additionally, you will need to know how to use /proc, disk utilities, ifconfig, /dev, knoppix, BBC, and dmesg to diagnose what may be ailing your hardware or causing it to behave in mysterious ways. There is nothing overly mysterious about Examiner™ for Linux+. Take a look at its features and contact us if you need to know more. As usual, we're happy to help. Examiner™ has everything you need to pass your exam.